New WIP uploaded. Semi-working AIW, Trackside objects. Working on texturing marshall stations and starter's tower in AC3D which is working pretty well. Mostly done and in game. Next up will be garage awnings which should be easy enough. The I will begin working on the corner markers. Next WIP release should also have a better ground surface. -Started modelling objects in ACAD and importing into track with 3D SimEd. So far I've done the starter's tower, Garage awnings, corner makers and Marshall's stations. Still working out how to texture them. -Got a functioning AIW with no crashes. My first track. Built with Bob's Track Builder from an Autocad-derived csv, allowing for very efficient packing of verticies in the turns. All elevations and cross-slopes are from a site plan and topo map of the actual track. I do not have access to 3D Studio, nor do I have any object modelling skills and I will need someone's help if this track is to be completed. if you would like to help with these items. -Basic tweaking of east & west course links (best I could do in BTB at the moment). -Real driver input on track conditions & bumps, etc. I figured I'd get this WIP out as I'n not sure how much farther I'll be able to take it and would like to get others interested and involved with it. 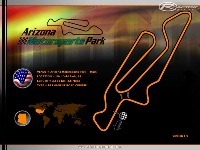 The real circuit was opened in 2003 to serve mainly as a club racing and test track. It was built right next to Luke Air Force Base in Litchfield Park, AZ. This would seem like the perfect location for a noisy race track, but unfortunately, it is also next to a golf course. Pretty much immediately, the track started receiving complaints about the noise and, without the proper permits, it was shut down. The track still exists but it is not currently in use as a race facility. It was only open for a short period of time before it was shutdown due to noise complaints, even though it's right next to an Airforce base. Hopefully it will reopen one day. JasonF started this track and made excellent progress. Due to time constraints he was unable to finish it. He graciously let me take over and finish it. He deserves at least half the credit for this track as it would not exist without his initial contributions. I've done my best to maintain quality of work that JasonF started with and finished it with future maintainability in mind. There are currently no setups for Arizona Motorsports Park. Add a Setup. just wanted to say thanks for all your hard work on this excellent track. @KickAstronaut - well sorry mate! That's all I can think of. I haven't heard of anyone else having the same problem and the track has been downloaded literally thousands of times according to mediafire stats. KickAstronaut, what settings are you using in your rfConfig? KickAstronaut, have you checked to make sure there are no extra files in your "Locations" folder? There should only be 2 files: commonmaps.mas & terrain.tdf. Also try deleting any AMP-related files in your UserData\LOG\HAT folder. My specs are: Intel Pent 4 Duo 2.80ghz, ATI Radeon 9600 (2006 All-in-One). Still no good.